On Amazon we found this beauty: a Kraus brand single bowl stainless steel under-mount sink. 70+ reviews and 5 stars? Yeah, I’m there. 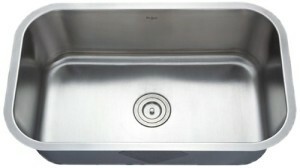 The Kraus sink checks all our boxes (including price – at $300, it left budget for a classier faucet) and it’ll arrive with plenty of time to spare before the measure in two weeks. We also checked Home Depot’s website, which boasts of its 4000+ sink inventory, but none of those 4000 sinks met our needs, either. I don’t know how that’s possible. This was an easy decision: I want a huge sink. Like, the biggest sink that will fit in this kitchen, because I am done fighting with runt sinks designed for washing nothing larger than a drinking cup! I have always been unhappy with double bowl setups in previous homes, and I can’t think of a single positive thing to say about them. I don’t do a lot of dishes by hand, but when I do it’s because I’m washing a couple one-off items like cookie sheets… and I don’t want soapy cookie sheets hanging halfway out the sink, dripping water and soap everywhere. I really didn’t know what I’d do with a narrow bowl or a corner bowl or any of the other oddities I saw on display in the sink aisle. Under-mount has changed my life. An under-mount sink eliminates any “bump” between countertop and sink, so wiping crumbs off the countertop and into the sink is effortless. Just wipe and in they go. Future buyers will love you for your under-mount sink choice. Also: no caulk rim around the sink edge to get dirty (or moldy). Stainless just looks and functions better. I’ve lived with two beige colored sinks that must’ve been painted or coated with something to give them that look, and they both looked nasty all the time no matter how much I scrubbed.